It was in Huddersfield that I had my first ever supperclub experience nearly three whole years ago. So it was good to be back in Kirklees to sample the wares of Huddersfield’s latest and most welcome addition to the supperclub circuit – Tallents’ Ten. Run by young chef Nat Tallents, people may recognise her from a short stint on Masterchef the Professionals or as lead chef at Mushroom Mina’s foraging supperclub. Nat is a self taught chef who started life as a waitress. Frustrated with just giving out food, she made the move to commis chef and within less than a year was head chef, having never cooked before! 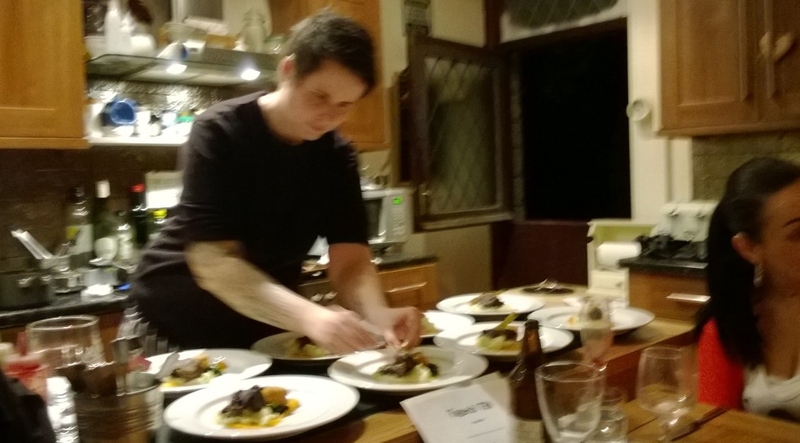 This entry was posted in Reviews, Supperclub Visits and tagged huddersfield, Supper Club, Underground Dining, Underground Restaurant on March 9, 2014 by martinimanleeds. It’s been a while since we’ve visited another supperclub, partly because we always seem to be running events when they’re on and partly because there haven’t been any new ones to try. Luckily there’s been a recent influx in Moortown in Leeds and word of mouth has finally got to us. Moortown’s a bit of a trek out from the Manor and even on our return our North Leeds taxi driver had never heard of the West Leeds suburb where we asked to be taken! 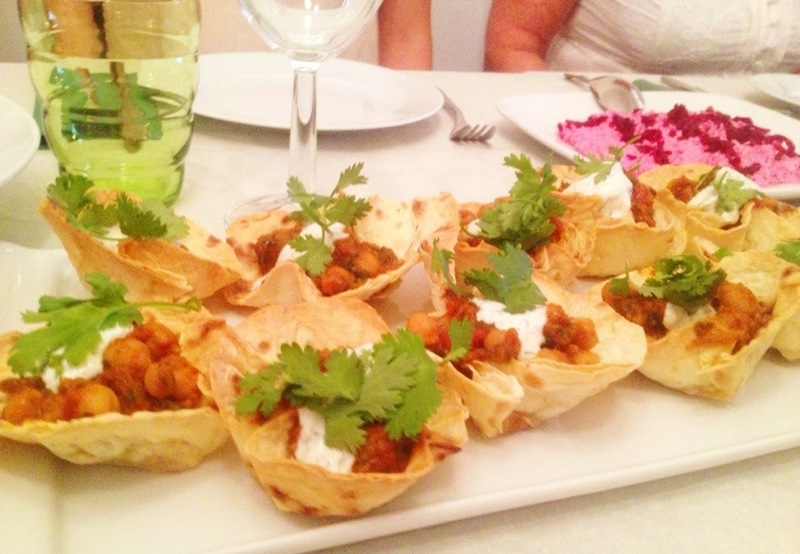 Anyway the first of our Moortown supperclub jaunts was to Afsaneh’s Persian Kitchen. Afsaneh is of Masterchef fame and her talents blew the minds of judges John and Greg but probably her nerves let her down on the day, this was the year that Shelina won. Thinking back to the programme, I was always impressed by Afsaneh’s dedication to her Persian roots. And going by the judges reactions, the flavours were as authentic as the dishes looked, and these were flavours I was keen to try. This entry was posted in Reviews, Supperclub Visits and tagged food, Leeds, Masterchef, Reviews, Supper Club, Underground Dining, Underground Restaurant, Yorkshire on July 28, 2013 by martinimanleeds. 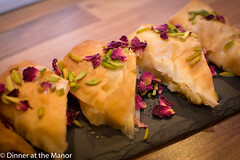 Last Friday night Dinner at the Manor enjoyed a long overdue visit to the supperclub at Chapel Allerton’s Sunshine Bakery. We know owner and head chef Dave from him visiting our supperclub in the past and have been hearing brilliant things about his tasty food at bargain prices. For those of you who haven’t visited the bakery by day it’s a cute, bijou, vintage dining room with antique tables and chairs crammed in amongst retro crockery and chintsy doilies. It was a very welcoming place from the prolific snow falling outside! The supperclub set up at Sunshine is a bit like an alternative restaurant. They don’t have a licence so you can bring your own wine, but you’re sat at your own tables rather than one big communal one. There were 3 choices for starters and main courses and then coffees, cupcakes and brownies for dessert. My starter was a brilliant garlic mushrooms dish, which came full of creamy flavour atop a crispy and chewy bun. This bore no resemblance to the dreary pub classic – it was absolutely delicious and extremely filling! Susie went for the chicken terrine which was moist and full of smokiness from the bacon. 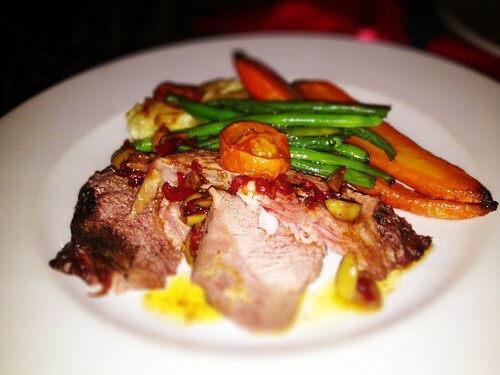 All of the main courses sounded amazing but without any faltering doubt I went for the leg of lamb cooked with garlic and olives and served with roasted carrots and potato dauphinoise. The lamb was super soft and melt in the mouth. The strong flavours of the garlic and olive gave it a lovely modern punch. The dauphnoise were luxuriously creamy and the roasted carrots were served elegantly in halves and had been roasted to perfection. It was a generous portion but I scoffed it all down! 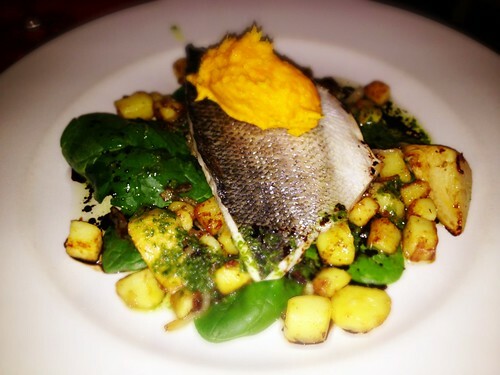 Susie opted for the sea bass with artichokes, sautéed potatoes, spinach and sweet potato purée. The fish was perfectly cooked and melt in the mouth and was complimented perfectly by the accompanying vegetables. We didn’t have much room left but for dessert we were treated to some of Dave’s baked goods. I had the crunchie brownie whilst Susie had the mint Aero. 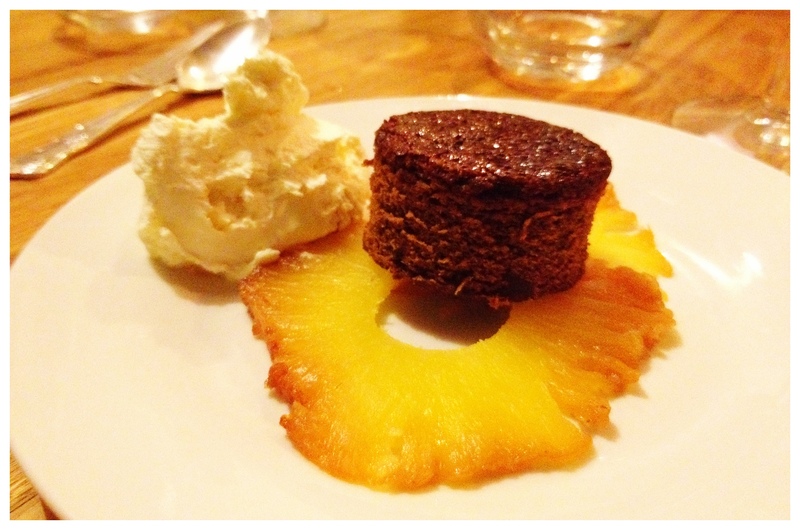 Both were deliciously moist, rich and full of cocoa – a lovely way to end a meal on a cold snowy night! The best thing about the meal was the price, which at £15 for 2 courses for top quality and tasty grub is unbelievable value. It’s probably just as well I live in a less glamorous suburb of Leeds otherwise I’d be at the Sunshine Bakery every night! The atmosphere is a calm and warm one. 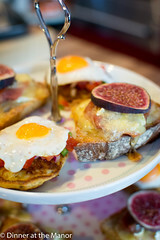 It’s obvious that the food takes centre stage with no need for pretentious frou-frou. We’ll certainly be back, thanks Dave! This entry was posted in Reviews, Supperclub Visits and tagged Dinner at the Manor, Leeds, Restaurants, Reviews, supperclubs, Yorkshire on January 21, 2013 by martinimanleeds. We had an olympic weekend in more ways than one these past few days. Starting with an amazing trip to the Olympic stadium to witness Yorkshire’s Jessica Ennis start her heptathlon campaign we then had to rush back up north to Manchester to get our fill of Kashmir cuisine at the Spice Club. Completely overtaken with olympic fever we had not anticipated that we would actually be dining on the eve of Team GB’s biggest athletics win – oops! 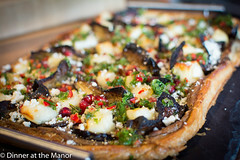 Fear not, the food provided more than made up for our withdrawal symptoms from the games! This entry was posted in Reviews, Supperclub Visits and tagged Manchester, Reviews, Supper Club, Underground Dining, Underground Restaurant on August 5, 2012 by martinimanleeds. 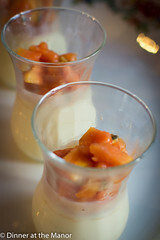 Last weekend was our much anticipated trip to Gusto Italiano, Leeds’ newest and most Italian supperclub! It’s run by (almost) celebrity chef Mario Olianas (of ITV’s British Best Dish fame) who is well known for his appearances at farmers markets across the city. He has now moved into the world of dining clubs where he serves up gutsy feasts using age-old family recipes. Mario is Sardinian and came to Leeds as a lad, fell in love with his partner and never left! His passion is for homemade produce and locally sourced meats straight from the farmer. This entry was posted in Reviews, Supperclub Visits and tagged Leeds, Reviews, Supper Club, Underground Dining, Underground Restaurant, Yorkshire on July 31, 2012 by martinimanleeds. 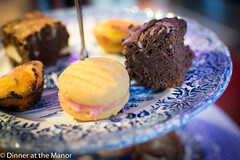 Dinner at the Manor goes underground for afternoon tea! 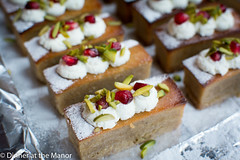 As part of our quest to visit as many supperclubs and underground tearooms that we can, we continued this year with a trip to Cafe Nouveau at Home based in Huddersfield, for the cake and wine matching event. Cafe Nouveau is run by Marie-Claire who has become a firm foodie friend this past year. Marie-Claire is a self proclaimed baker obsessive who loves to bake every night! 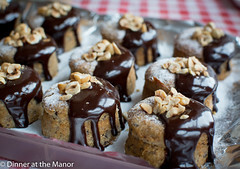 She bakes and decorates beautiful cakes for all occasions as well as running this monthly tearoom from her pretty home. 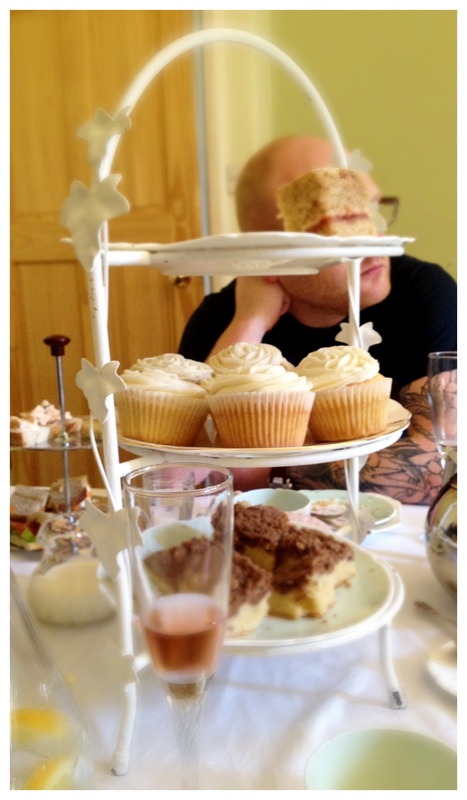 Those of you who know me will be aware of my sometimes ‘grumpy’ attitude to afternoon tea. As pleasant as it is, sometimes all I want is a decent meal at a ‘proper’ time. Having said that my recent forays into afternoon tea have been glamorous and fulfilling, so I take it all back! At Marie-Claire’s we were invited to walk straight in through the front door without knocking. On arrival everyone else was already sat down around the large dining table that was groaning under the weight of delicious treats and vintage china. Martin, Marie-Claire’s husband was quick to take our drinks orders. A delightful array of choice was on offer and so I opted for a spiced masala chai, which is quickly becoming a firm favourite of mine. 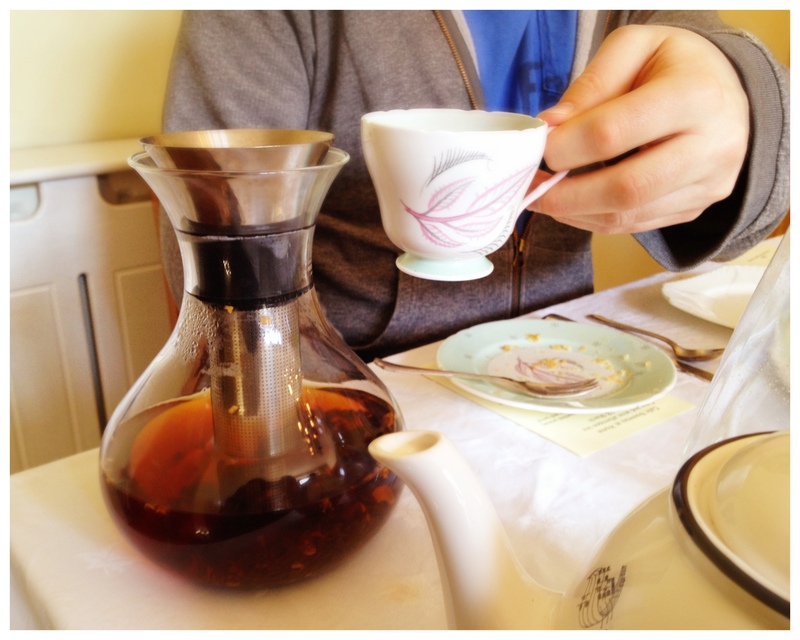 It was served in a fun, Danish device that was a bit like a wine carafe. 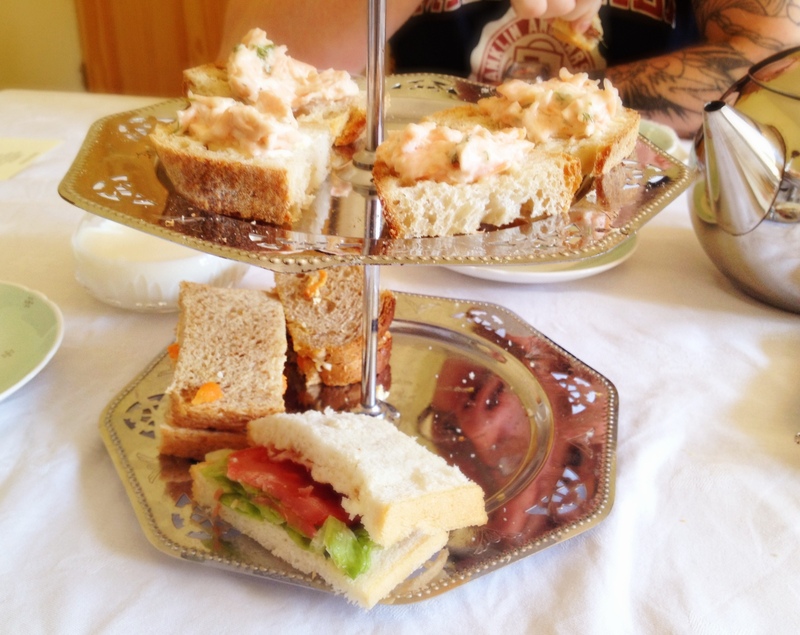 We were invited to start with the savouries, which were sandwiches of Wensleydale and carrot, BLT and an open sandwich of poached salmon. These were dainty and tasty and beautiful to look at it. Other savouries were mini sausage rolls and an onion tart. 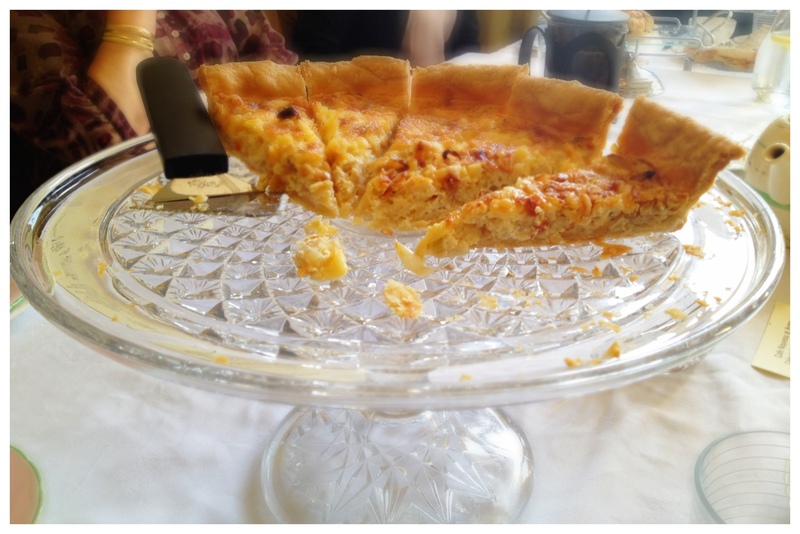 The tart had lovely crispy and chewy pastry. The sausage rolls had a nice spice and garlicy taste. They provoked debate about what they should be called with some feeling they were too dainty for the robust working class title of ‘sausage roll’. I thought that was tosh though! 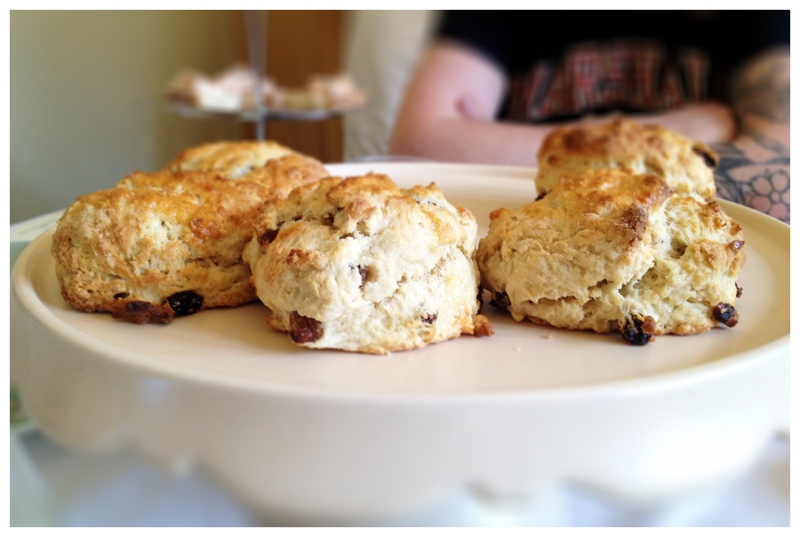 Next up were some light and fluffy fruit scones with jam and gooey clotted cream, lovely! Then we started to be introduced to the main event of the day – a selection of handbaked cakes all paired with a different glass of wine. Rob and his wife of the eponymous Hoults Wine were in attendance and had carefully picked a wine for each cake. This was no mean feat as cake is well suited to sweet dessert wines but Marie-Claire was clear that she wanted ‘normal’ wines to be paired to the sugary treats. First up was a strawberries and cream cake. 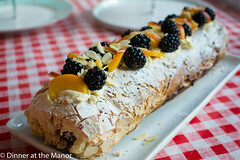 The fruitiness of this cake was paired with a sparkling pinot noir rose. They were a perfect match, bringing out each other’s light freshness – a good summer combo. Next up was a vanilla cupcake. There was much discussion about how hard it had been to find a wine that suited the intense sweetness of the buttercream, but success was found in a Niento Senetiner Torrontes from Argentina. The richness of the wine stood up to the buttercream and was delightful. Now it was time for an apple and cinnamon crumble cake, which was a family recipe for Marie-Claire. The wine it was paired with was my favourite – a Sables and Galets Gewurztraminer from Austria. This was so rich, you wouldn’t be able to drink more than a couple of glasses. But in terms of using it as a complex pair it was truly exciting. Our final pairing was a decadent gateaux opera that Marie Claire had perfected at a Betty’s cookery class that I hope to do this summer. The coffee and chocolate notes in this were paired with a Bremerton Selkirk Shiraz from Australia. This was not my cup of tea at all. I do like red wine but this was too smoky and savoury for me. I could imagine the cake working with another red wine though. 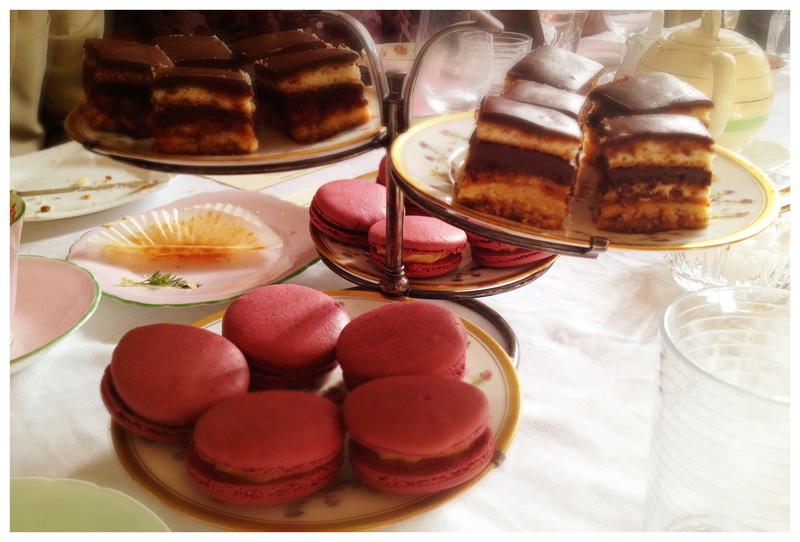 Just as everyone was groaning about how full they were the salted caramel macarons were whipped out! These were stunning. They were so perfectly made I was convinced that Marie-Claire had bought them in! She was full of tips about how to get them right, including leaving your egg whites out for a few days before using them. Anyway an Austrian dessert wine was brought out for this. I liked the macarons and I liked the wine – just not together! A great afternoon was had in the end. I admit I was not on my best form as I was in the process of cramming for a job interview the next day and was using the tea as respite! 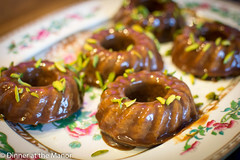 It was a delight to visit Marie-Claire’s lovely listed home and sample her delicious baked treats. I learnt a lot about the wine, but in a relaxed and informal environment. A secret dining success! 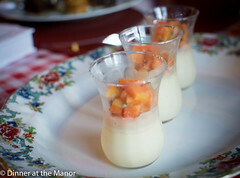 This entry was posted in Supperclub Visits and tagged Undeground Tearooms, Underground Dining, Underground Restaurant on March 30, 2012 by martinimanleeds. Last night saw us visit Leeds’ newest supperclub, the Bootleg Belly. Run by couple Justin and Lisa it is only a mile up the road from the Manor, so we were chomping at the bit to pay a visit. We’ve met Justin and Lisa a few times now, who are great fun and the kind of people we hoped to meet through doing the supperclub. The torrential snow was still descending as we started our journey and we were worried it would put other guests off from coming. We managed to convince the Manor’s pot washer to give us a lift on his day off. The promise of gourmet delights was also too much for others who ended up abandoning cars all over West Leeds in order to get to the Bootleg Belly for their tea! The delicious ginger cake with pineapple carpaccio - unfortunately this was the only picture we took as greed got the better of us! This entry was posted in Reviews, Supperclub Visits and tagged Leeds, Reviews, Supper Club, Underground Dining, Underground Restaurant, Yorkshire on February 5, 2012 by martinimanleeds.